We can find out a lot about a football team just by the way they play in big games. 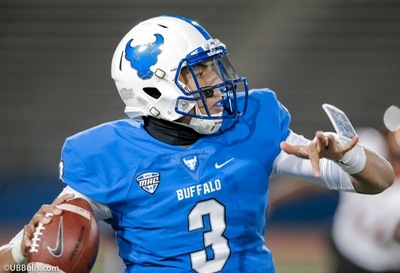 In the case of the University at Buffalo Bulls, this team might not be the team we thought they were. 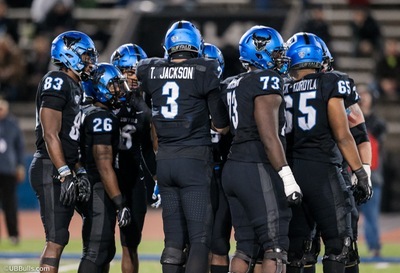 UB has played 11 games and have an excellent 9-2 record. Yes, they have come up big in most games and widely outplayed their opponents. In two games though that were perhaps against the toughest opponents the Bulls have faced this year, they didn’t show up and that is disturbing. In week-5 of this season Army came to UB stadium. UB got up quickly on Army with a 53 yard TS pass to K.J. Osborn on UB’s first series. Army quickly stormed back with a very physical running game and scored their next three possessions to grab a 21-7 halftime lead. Army never let up and went on to win this game by the score of 42-13. In that game Army outhustled UB, outhit UB and basically played a far more physical football game that UB couldn’t handle. At the time I don’t think that much of it given the fact that Army’s scheme is so different than most others in college football. The following week, UB traveled to Central Michigan and won 34-24, so to me the Army game was an anomaly. Fast forward to Wednesday night at Ohio University. UB had a chance to clinch the MAC East and then rest some starters next week at Bowling Green before a tough MAC Championship game in Detroit. UB also had a chance to gain some ground in both the USA Today coach’s poll and the AP poll as far as rankings. It was a great chance for UB to show how good a football team they were. The problem is that much like the Army game, the Bulls didn’t show up at Ohio. Just like against Army, UB got off to a quick start by scoring on their first possession but after that it was all Ohio as they ran the ball at will and pushed UB’s defense all over the field. That’s two physical football teams that had their way with UB. The question is, is that the way to beat Buffalo? What is worrisome is that UB now has to go on the road again to Bowling Green and try and clinch the MAC East. Yes, Bowling Green is at the bottom of the MAC’s standings but that doesn’t mean they will be a pushover for the Bulls. They can try and play the same physical game as Ohio and they just may well have success. Assuming UB does beat Bowling Green, they will have to face Northern Illinois in the MAC Championship game. Northern Illinois is a tough, physical team and they can run the ball as well as any team in the MAC. Northern will easily be the best team UB has faced in 2018. For UB to win this game they have to change their M.O. I don’t know if that is possible this late in the year. A week ago this looked like it could be the greatest season in UB football history. A week later, all those bets are off. How things change.